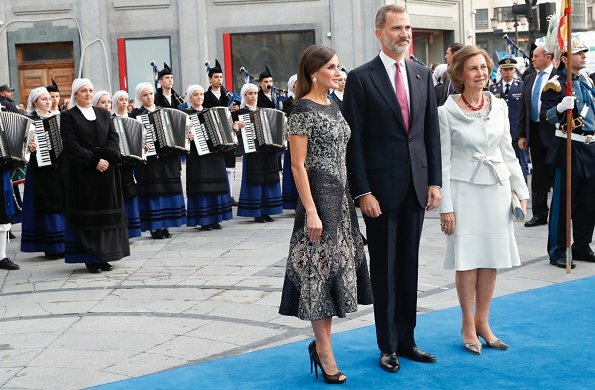 On October 19, 2018, King Felipe VI, Queen Letizia and former Queen Sofia of Spain attended the 2018 Princess of Asturias Awards ceremony, held at the Campoamor Teather in Oviedo. US film director Martin Scorsese received the Princess of Asturias Award for the Arts 2018 from King Felipe. Other laureates are the nonprofit Amref Africa group, which uses planes and mobile technology to deliver health care across that vast continent; American political philosopher Michael J. Sandel; Mexican investigative journalist Alma Guillermoprieto; and mountaineers Reinhold Messner from Italy and Krzysztof Wielicki from Poland. Very glamouros dress and I really like her hair. Not a bad looking dress,for me the pattern is a bit too busy. Letizia can carry it of. Q Sofia's suit is very elegant as ever. I also agree, it is too strict. She looks awesome...love the dress. Uau.the dress and the pattern of it are absolutely beautiful. 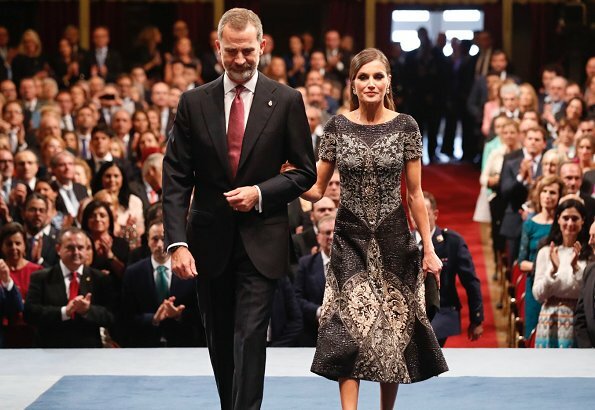 One of Letizia's best looks ever. The dress is gorgeous and fits perfectly, proves you can have a smaller frame and wear fuller designs when they fit properly. Great shoes and so chic hair. Love it all! Die jurk is prachtig, één vd mooiste jurken van de laatste tijd van alle prinsessen. The dress is beautiful. There is a lot to take in. The inspiration, the textures of fabric, the overall layout of the pattern and the many hours it must have taken to sew the beaded design. Praise for Mr. Varela and the Queen. Some have called this dress a work of art. The hair stylist is a genius. I have read that the style mimics the traditional Asturian headdress worn by the ladies behind her in picture #1. Bravo! to everyone and Congratulations to the winners. Thank you for explaining her hair. I, too, love her dress. It really is a work of art. I like the dress and the outfit very much!! I really have nothing to say other than she looks absolutely amazing - everything on point. 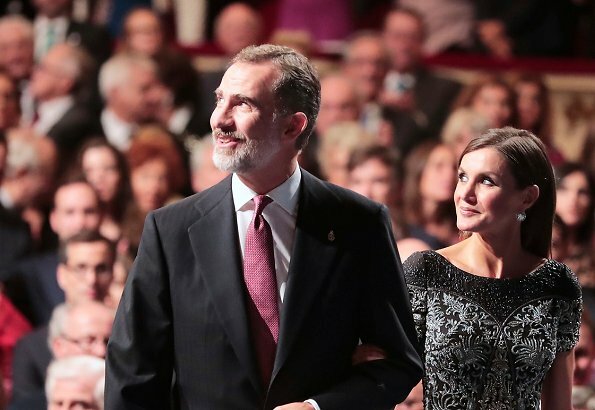 Sólo se me ocurre una palabra para Letizia: majestuosa. 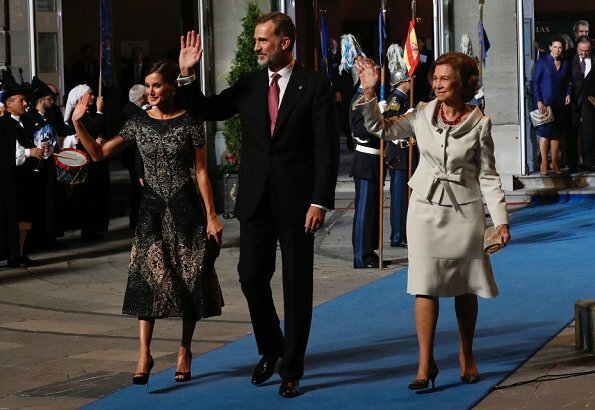 Es un vestido de Reina, una obra de Arte, de lo mejor que ha creado Varela. El maquillaje y peinado son espectaculares. No nos aburrimos con la Reina de España. Que puedo decir, de acuerdo totalmente. 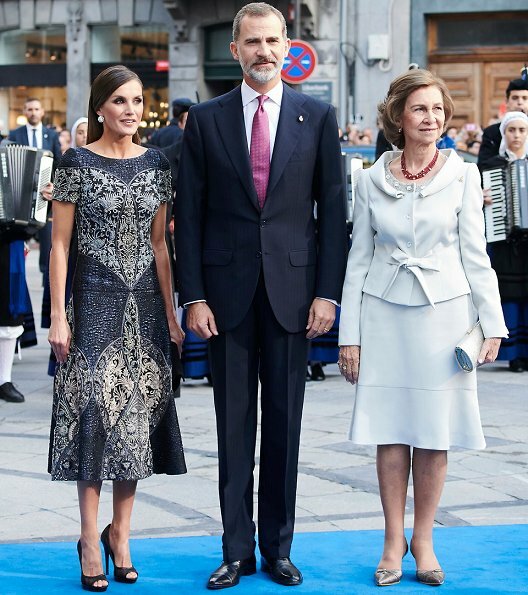 I can see that Queen Sofia is more elegant and stylish than Q Letizia today.Her dress looks heavy and busy as well as her makeup. Majestuosa con este vestido increíble de Museo. No se puede decir más. Although this dress is nothing I would ever pick, I have to say that it is a work of art, delicate and majestic, and the Queen can carry it like few. Fantastic embroidery job, and incredible silhouette. The hair is simple as not to take away from the dress, as well as the jewels, more would have been too much. I don't like the shoes, perhaps because I am a little tired of peep toes, that being said, they do go well with the outfit. Queen Sofia, looks like any other day, I would have preferred to see her with a little more panache. This dress was created for a woman (see roles of Tina Turner or Lucy Lawless) who knows who she is and what she wants out of life. If she chooses to wear it again it would be interesting to see in what setting. It would be fun to sit in on the brainstorming sessions with Mr. Varela. No detail is random when it comes to Letizia fashion. Agree with you Cherry Blossom, that dress of Letizia is really a piece of art. But I think Sofia looks also exceptionally good here. Sublime, bellisima, no considero necesario añadir mas.